I hope each of them has more lungs than the Holy Father. This is exactly why I never believed my mother when she told me that smoking doesn’t make you look cool. This is exactly why I never believed my mother that Cardinal’s robes don’t make you look cool. Lickona, how did you miss this? I’ve had a stomach flu all week; off my game. That’s awesome. But not as awesome as Sancho and Fonzarelli. I don’t know why, but this picture makes me think of a buddy-cop tv show. Maybe like they’re with some sort of Bureau of Internal Affairs in the Vatican…. Two guys stand between the Pope and the forces trying to bring him down. Two guys who dress a little different and answer to a different boss. And the scene freezes. Tune in next week! It never before crossed my mind that we could have a pope who smoked. Now I’m pretty sure we must have had one. I still can’t picture it. Can’t you see Leo XIII with a cigarette holder? Oh yes. And then I’m thinking John XXIII. 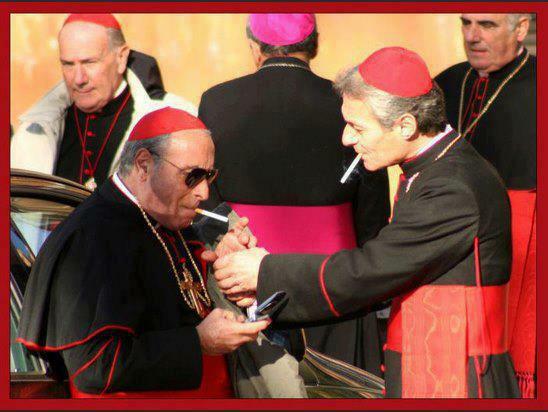 As far as I can see all Italians smoke, so a lot of the popes must have been smokin’. Also, wrt the Holy Father having one lung. I’ve been thinking about the Patriarch of Constantinople attending the installation and how ironic it would be if the Church starts breathing with two lungs again under the pope with only one. [H]ow ironic it would be if the Church starts breathing with two lungs again under the pope with only one. Dum spiro, spero — but I ain’t holding my breath. Well, I expect everything, but I don’t expect anything. You guys have made it all the way to the New. York. Times. Not to worry. Sauron’s gaze is already passing. You see a lot, Father. I think I just found my next desktop screensaver.